One of the older Korean restaurant in Singapore that predates the Da Jeong Gin (大長金) days, when Korean food in Singapore meant all-you-can-eat BBQ buffet at Seoul Gardens. Time has changed, Seoul has changed its Chinese name from Hancheng to Shouer, everyone’s crazy abt K-pop and Koreans have claimed that they invented everything from Confucianism to fried rice. Besides authentic Korean soul food (puns intended), Auntie Kim’s was (in)famous for another reason – bad service. You eat what your served, no questions allowed – you know better or I do? With the popular DJG series, Singaporeans ascent to the class of Korean gourmets and claimed to know this particular type of cuisine better. Or do they? The meal started with an assortment of preserved and marinated vegetables (and sometime seafood and meat depending on what’s leftover in the fridge the week before). These were treated like some kind of hor d’oeuvres and devoured down straight away by hungry hippos as they were usually refilled. Auntie Kim has stopped the refilling policies to kimchi and only 2 servings because kiasu Singaporean was known to just eat these for the proper meals and not ordering anything much after that. The kimchi was flavorful and not as salty as the supermarket variety. The leaves were still firm and crunchy, of course we took the offer for another serving of the kimchi. If you want more, please buy from them as they are available for takeaway. 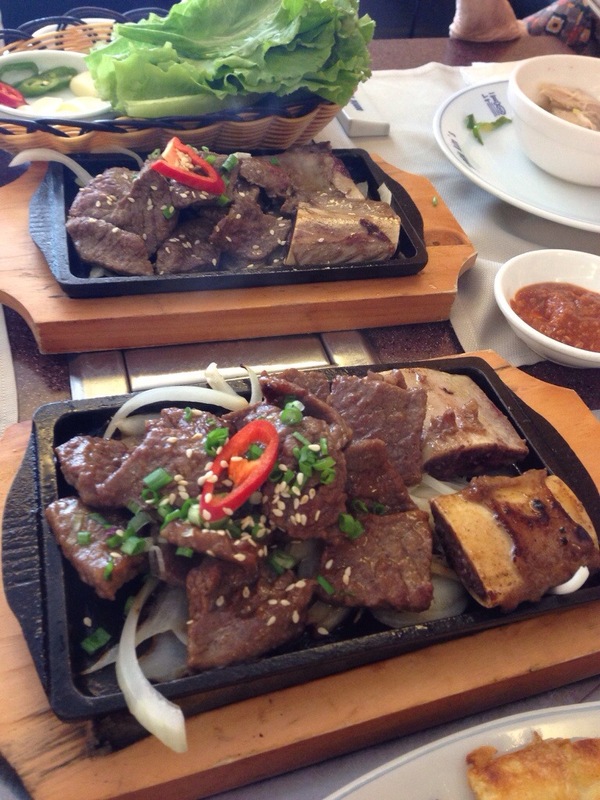 We ordered BBQ beef, one marinated in the style of Bilgolgi and the order just salted and enjoyed for the marbling on the meat. Typically you will BBQ it at the table. But this being lunch and we don’t want to smell of the smoke for the rest of the day, it was done in the kitchen. They never offered any way we want for the beef and came back fully cooked. I was sure it was just pan fried instead of grilled on the BBQ. Next up, the quintessential ginseng chicken soup. This is the must have food for Summer as it is supposed to boost the immune system for the hot days ahead. We visited the restaurant in May, supposing that it was Summer and ordered this dish. 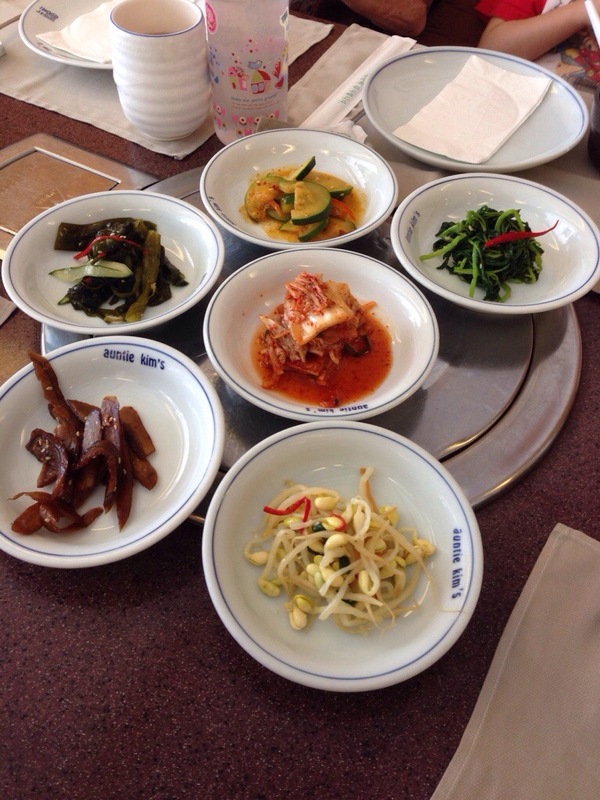 In Korea there are restaurants that only served this dish and open only in summer. It came with a shot of ginseng wine that was supposed to be poured into the soup. But as we have children for the meal, we decided to skip that and took the shot neat instead. That really gave good genki for the rest of the day. Without the shot, the ginseng soup tasted, well, like chicken. 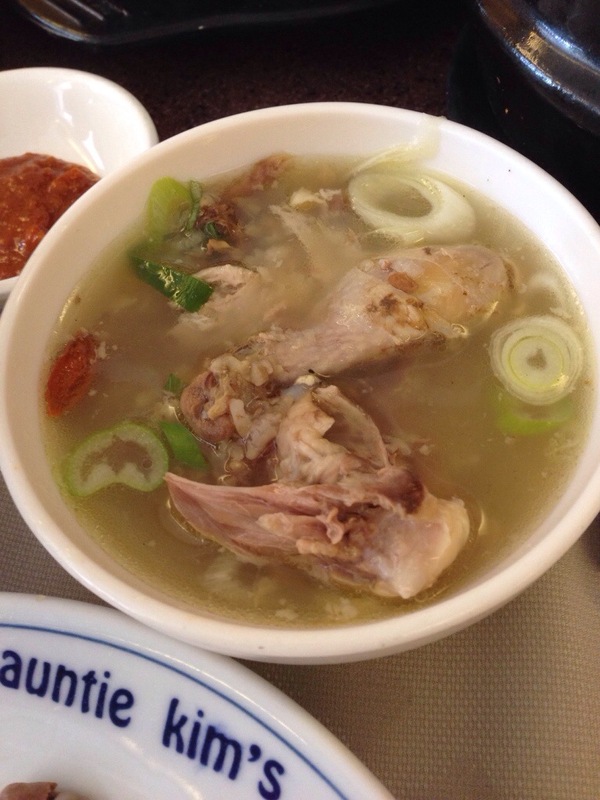 So far I have not found any ginseng chicken soup that tasted like the one I had when I visited Seoul many months ago. I have to apologies for this photo as it has already a bite off the pancake. 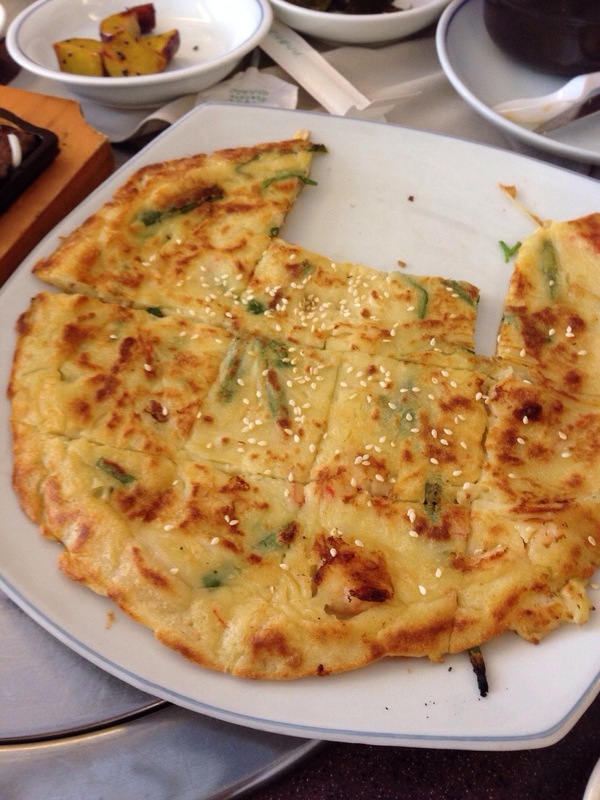 Korean pancakes are the favorites of children. Normally children (and most adults) will shrugged at the amount of spring onions and chives used with an omelette. Which leaves me wondering why they will voluntarily devoured this pancake which has only one more ingredient – a batter. Perhaps it’s because it looked like a pizza and tasted like an omelette that combination of two comfort foods that do it. 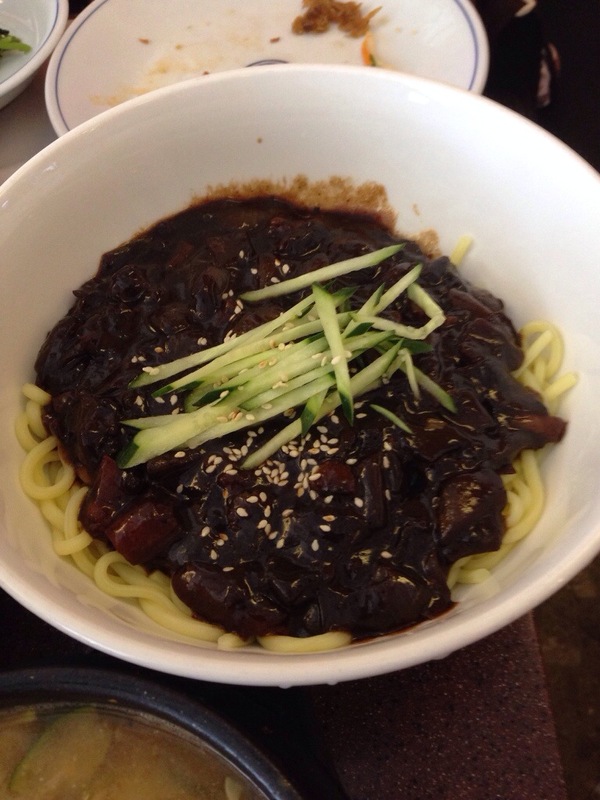 Ja Jeong Mian is another very strange dish from Korea. Again restaurants are dedicated to serving this one dish. And then it is seasonal. And unlike the Chinese version, the savory sauce is actually a thickened broth instead of a mix of several sauces. But the roots are similar so that it would soon invoke another great Sino-Korean debate on who invented the Ja Jeong Mian (炸醬麵). Both sauces are broadly based on fermented black bean paste with legumes like potatoes, carrots, radish, turnips, etc. Koreans diced they into tiny cubes while the Chinese shredded them into thin julienne. The Korean sauce is like Lor Mee – essentially corn starch water mixed with the sauces and boils to get the sticky consistency. The Chinese just use the sauces. So go figure. 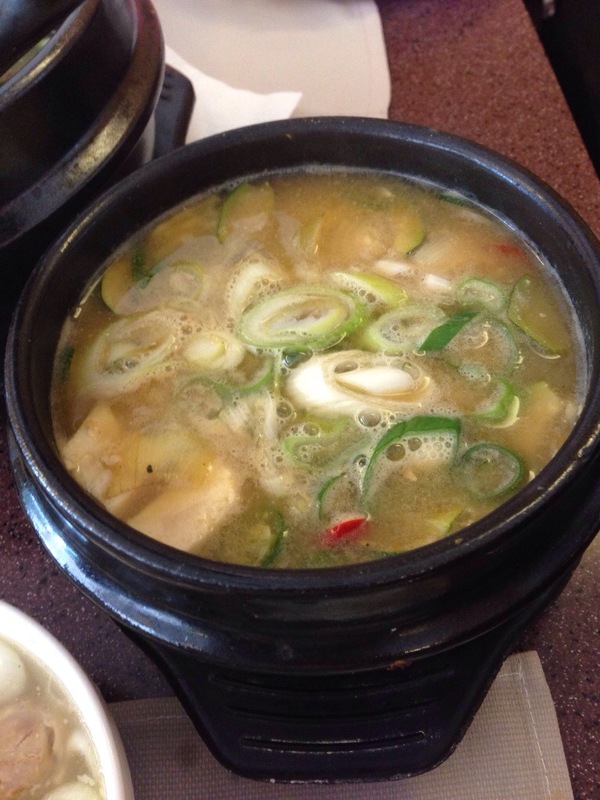 While we may question the root of the dish, this last soup that we ordered is definitely firmly rooted in Korean. Again fermented soy bean paste is used with leeks, garlic and other strong condiments and boiled with clams (and sometime bits of beef brisket). The perfect cure for a shochu hangover. Kim’s – Not bad, not fantastic. Good place for a quick Korean good fix, be prepared to pay $50-$70 pax without drinks. Limited parking so be eco-friendly, car pool please.